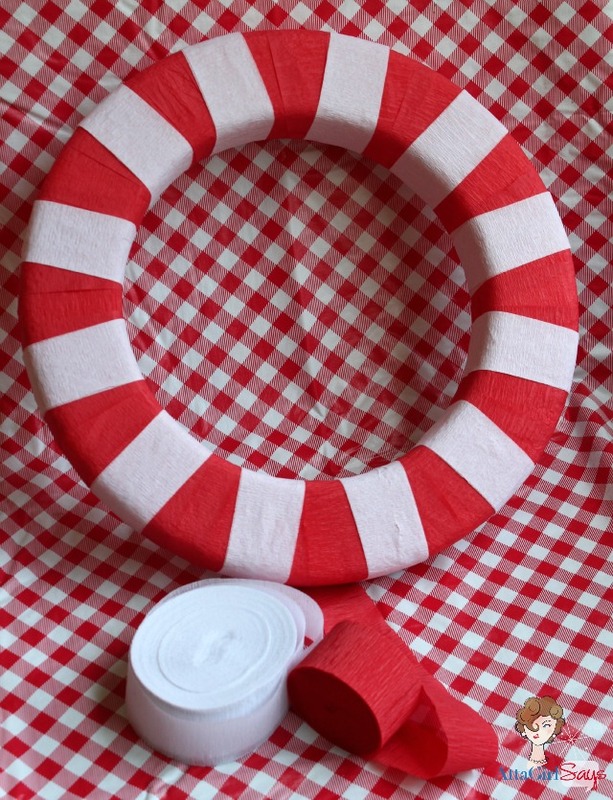 If you watched my live Google+ Hangout yesterday, then you saw the picnic wreath I made using party supplies and a Styrofoam™ wreath form. Who says you have to decorate a wreath with flowers? 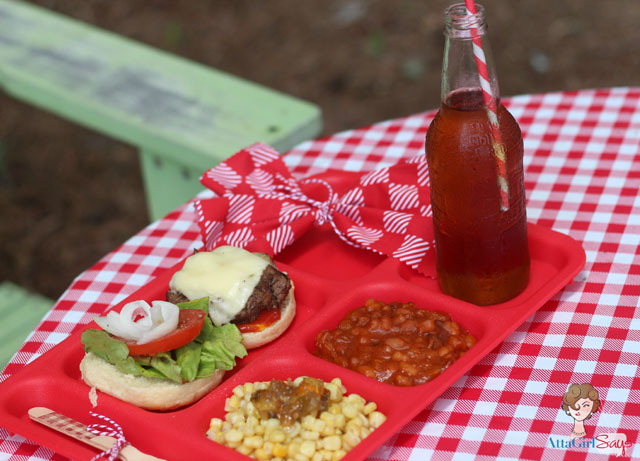 Why not mustard bottles, hotdog trays and paper plates? In case you missed it, I wanted to share the finished wreath and provide you with more details about the supplies I used to make it. 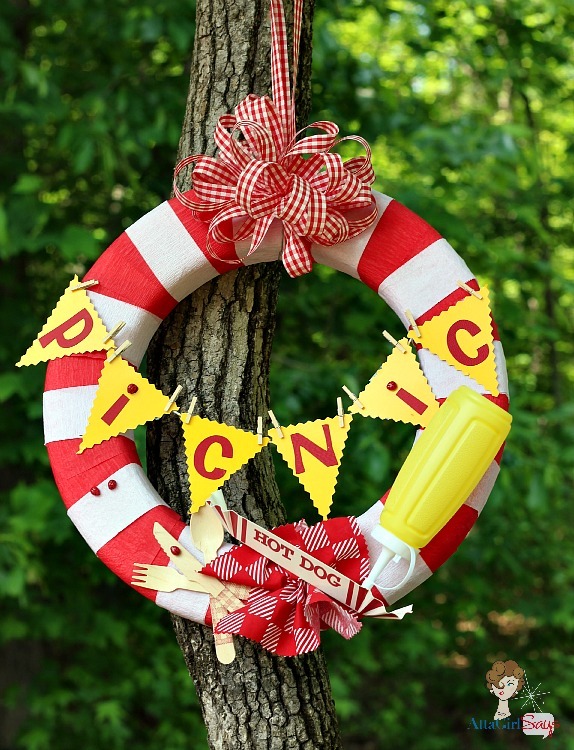 I started out with a sturdy Styrofoam™ wreath form, then I raided my party supplies box and my craft stash looking for items that worked with my picnic theme. 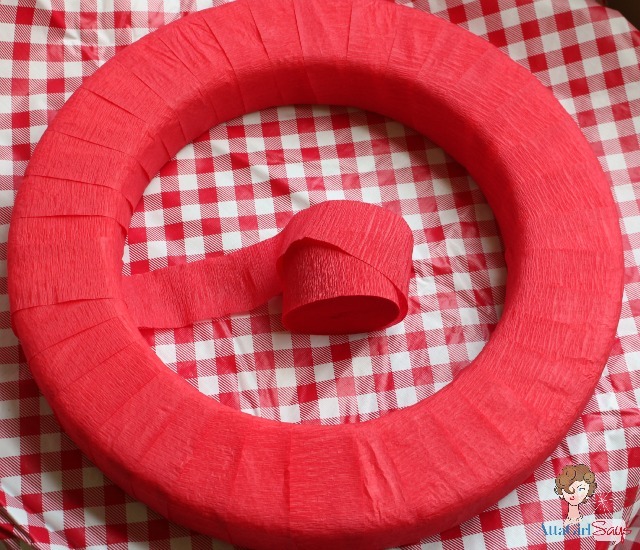 I began by wrapping the wreath form in red crepe paper streamers, which I pinned into place with straight pins. Because I wanted to mimic the look of an oilcloth tablecloth, I added bands of white streamers, pinning them into place, as well. 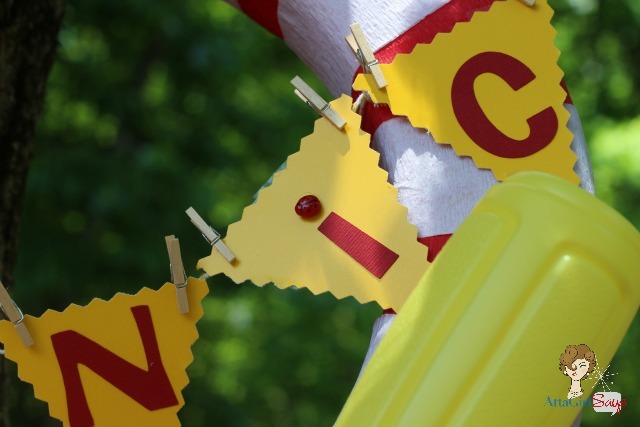 I used pinking shears to cut triangles from some bright yellow paper dessert plates to create a bunting banner. I used my Silhouette Cameo to cut out the letters P-I-C-N-I-C. I strung the bunting on yellow baker’s twine from Pick Your Plum, and added some cute clothespins from Michaels to cutesy it up. Ants aren’t invited to my picnics, but ladybugs are welcome. 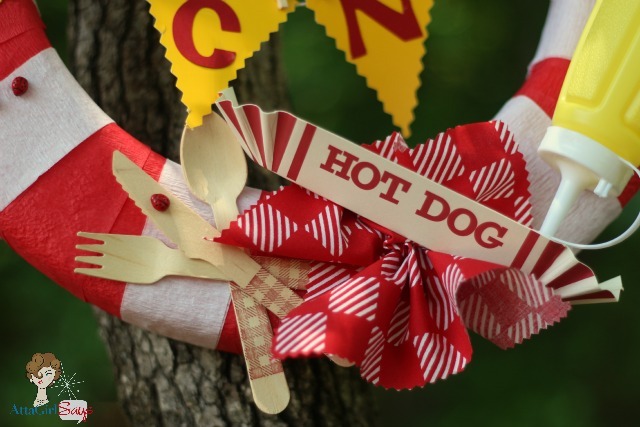 I glued tiny ladybug beads (pulled from my craft stash) onto the bunting to dot the i’s in picnic. Those ladybugs are real party animals. They’re all over this wreath. There’s another one, crawling on some wooden utensils (another Pick Your Plum find) that I decorated with a checkerboard stamp I just happened to have in my craft closet. The stamp set is a retired one called House & Home from Stampin’ Up. I used my pinking shears to cut a napkin from some pretty red-and-white fabric. I cut a paper hotdog tray (from Michaels) in half and attached it using straight pins. And yes, that is a mustard bottle (empty) decorating the wreath. I attached it using some heavy-duty floral wire. I finished my wreath up with a red-and-white gingham bow that my neighbor so kindly made for me since my bow-making skills are lacking. 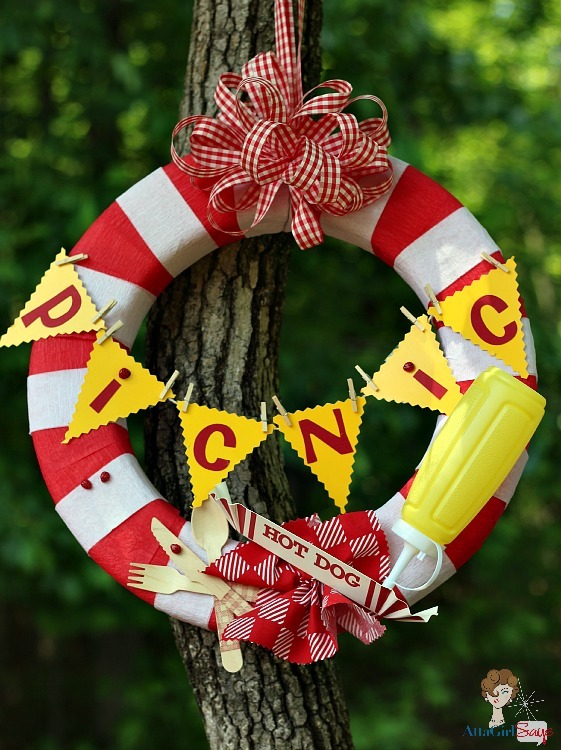 I think this wreath makes the perfect decoration for an outdoor picnic, cookout or barbecue. That’s a burger on a homemade hamburger bun (recipe courtesy of my friend Marty of Marty’s Musings) with a side of southern baked beans. Want more wreath ideas? Check out my wreaths for every season here. Disclosure: FloraCraft provided me and 18 other bloggers with a free wreath form for this challenge. I was not compensated for this post or my project. This post also contains affiliate links. 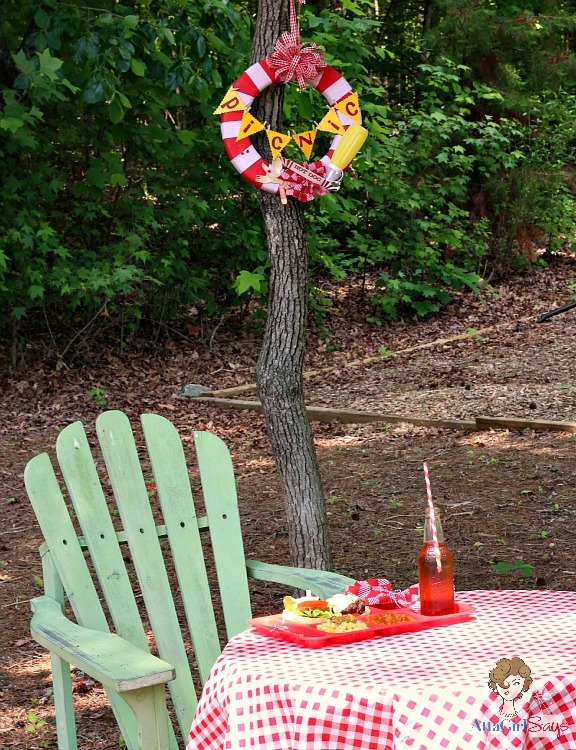 I love, love, love what you did with your wreath, Amy! This is just adorable Amy! Cute as a button! I have no bow making skills, either, and apparently, not wreath making, either! How’d you like the hamburger buns? LOOOOOVE this. 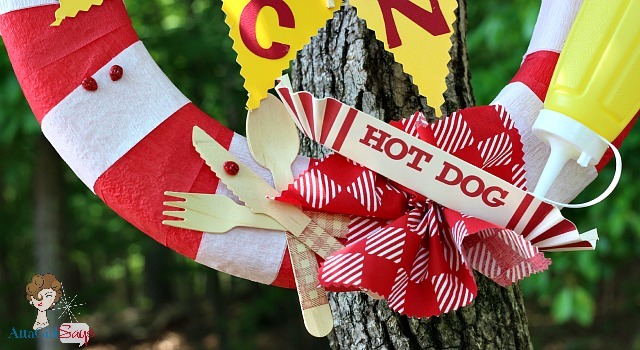 I can’t wait to make one for an upcoming cookout. This will be so cute on my back deck. You’re so clever! Cute, cute, cute Amy!! !…Just love it!!.. Adorable wreath! 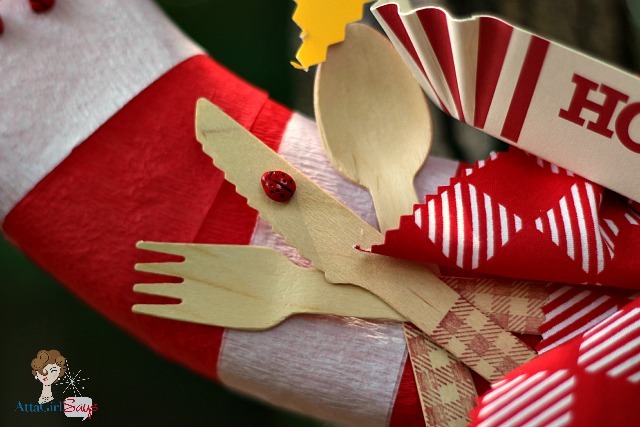 I love that the utensils also have red on them, and the mustard bottle is cute on the wreath. What a cute idea! Some of the best decorations are the unexpected ones. Thanks so much for sharing and being a crafty Friend of Pfister! Oh my goodness Amy this is soooo cute!!! I love it!! Pinned and shared!!! Amy, that is really really cute. This is about the cutest thing ever–and there’s still great weather for lots of pinics! CUTE! Very clever idea. I always forget to decorate outside! I LOVE this. So cute and ridiculously fun. I need to make one ASAP! So cute! This is so much fun! 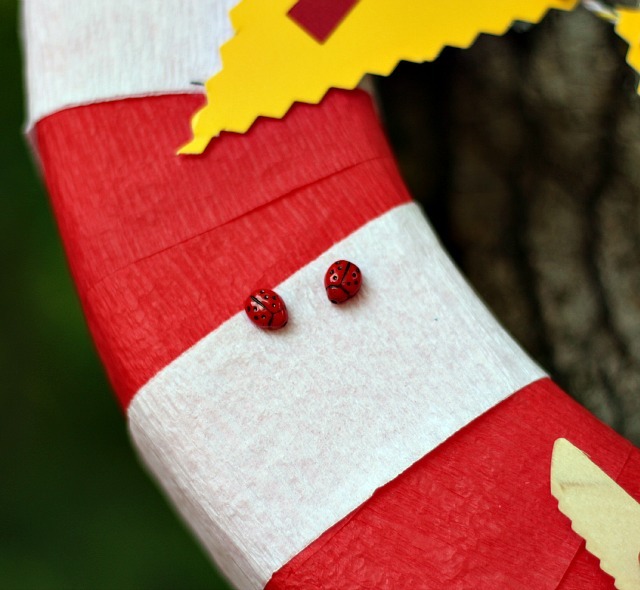 Those ladybugs slay me — so cute! I love it, Amy! Your wreath is so fun! Oh my gosh this is the cutest wreath ever! Thanks! It’s one of my favorites, too! Oh, my, Amy this is just the cutest creation! I pinned it and will be waiting for the occasion that i will be able to make one for! Loved your diy! Thanks for sharing at the Inspiration Spotlight Party! Pinned & Shared! Hope to see you again soon! This is so festive, it’s adorable. Thanks for posting. Hello from Best of the Weekend Party.